When Kerim Ture was first building his online fashion retailer for Muslim women, would-be investors would make Islamophobic jokes. “They would say: ‘Let me guess the colour of this year?.?.?. ?is it black?’” he recalled. But Mr Ture looks to be having the last laugh after his Istanbul-based company announced that Goldman Sachs had taken a minority stake. Modanisa — and its range of conservative clothing in a kaleid oscope of colours — is part of the rapidly growing “modest fashion” sector. Analysts say the interest from Goldman demonstrates that the sector is no longer considered a novelty, but is instead being taken seriously and entering the next phase of growth. “It brought a smile to my face to see the story,” said Shelina Janmohamed, vice-president at Ogilvy Noor, a division of the London-based marketing agency Ogilvy that helps brands target Muslims around the world. She said that the investment showed “the big corner that we’ve turned”. The global Muslim population of 1.8bn people is the world’s youngest and fastest-growing consumer group, according to analysts. Last year’s State of the Global Islamic Economy Report, by Thomson Reuters and DinarStandard, estimated that Muslim shoppers spent $270bn on fashion in 2017, rising to $361bn by 2023. Not all of the world’s Muslim women wear a headscarf or adopt the more covered-up style of dressing that often comes with it. In Turkey — where the headscarf is a deeply divisive and highly political issue — many women would be quick to point that out. But the report pointed to a “noticeable shift” in established western brands interest in modest fashion. French perfume and cosmetics brand Lancôme unveiled Malaysian actress Noor Neelofa Mohd Noor as its first hijab-wearing ambassador and Nike launched a sports hijab in 2017. Last year, luxury brand Dolce & Gabbana, US department store chain Macy’s and fast fashion giant H&M Hennes & Mauritz all rolled out lines specifically aimed at Muslm women. Modanisa was launched in 2011 by Mr Ture and four friends. The company has taken advantage of Turkey’s long history of textile production to work with 650 designers and suppliers, many of them small ateliers run by women. Its website serves as an online portal for these different brands. While many Turkish online retail start-ups have felt little need to look beyond Turkey’s 80m-strong domestic market, Modanisa has succeeded in expanding globally. Exports comprise 80 per cent of the business — making it well-placed to take advantage of last year’s dramatic slide in the Turkish lira. Its biggest international markets are Saudi Arabia, the UAE, Jordan, Germany, the UK and the US. The site sells to 2m customers in 130 countries and analysts estimate it has annual sales of between $120m and $150m. Its main competition is Indonesia’s Hijup and local rival Sefamerve, as well as Dubai-based high-end website The Modist. Modanisa has undergone several funding rounds, including a $5.5m injection from Saudi Telecom’s corporate ventures fund in 2015. In the latest round, Dubai-based venture capital firm Wamda Capital increased its existing holding and Goldman took a stake. The size of the deal was not disclosed, but it is understood to be less than $50m. Khaled Talhouni, managing partner of Wamda Capital, said there was “significant room” for growth. “Modanisa can truly become a wider emerging market player beyond” Turkey, he said. Modanisa said it would use the cash to further expand overseas operations. New logistics centres in Europe and the Middle East are being planned in order to enable faster shipping times and make it easier for customers to return items. The company is also set to open an office in London this year, followed by others in Amsterdam and the UAE. Although the sector is growing, Alia Khan, chairwoman of the Islamic Fashion and Design Council, pointed out that companies needed to keep pace with the obstacles facing retail as a whole. “Let’s not fool ourselves and think there’s some kind of magic pill that makes us exempt from all the other challenges that retailers face online and offline,” she said. 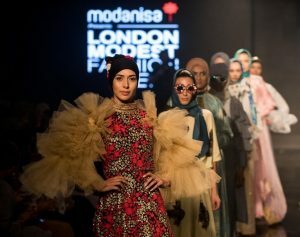 Modanisa has sought to boost its brand by sponsoring a series of Modest Fashion Week events in London, Istanbul, Dubai and Jakarta, and teaming up with social media influencers with hundreds of thousands of Instagram followers. Lifestyle Turkey 2019: Modest Fashion Exhibition, the only commercial modest fashion fair in Turkey and the Middle East, this year is hosting prominent names from the sector at the Istanbul Congress Center between Jan. 17-19 with the aim of bringing together domestic and international companies and consumers. Created to serve the industry by providing over 5,000 domestic and some 1,000 international buyers the opportunity to reach Turkey’s leading modest clothing suppliers, Lifestyle Turkey Fair being held for the third time. Aiming to determine the trends of global modest clothing each year to guide trade, the fair, supported by Turkey’s Ministry of Commerce, is expected to bring together 100 exporters, including 30 overseas firms. Representatives of the sector from Saudi Arabia, Afghanistan, Iran, Iraq, Jordan, Lebanon, Russia, South Africa, Palestine, Germany, the Netherlands, Belgium, Uzbekistan, Azerbaijan, France, Indonesia, Qatar, the United Arab Emirates, Egypt, Nigeria, Algeria and Libya will be attending the fair, providing an array of export opportunities for Turkish manufacturers. The brands attending will also present their summer collections during the three-day fair, while several panels and presentations on topics such as “the relationship between fashion and art” or “branding” as well as workshops such as graphics work on denim and fabric painting will be held on the sidelines of the exhibition. Modest fashion, which caters specifically to the wardrobe needs of Muslim women, has become one of fashion industry’s fastest growing branches with annual global sales reaching over $250 billion. Turkey is among the top modest fashion markets, along with the United Arab Emirates, Nigeria, Saudi Arabia and Indonesia.